BERLIN, CT, January 7, 2019 –Yale today expanded its popular Assure Lock line of smart locks with the introduction of the Assure Lever, a new lever lock designed for single-hole doors from side entries, garages basements, interior rooms and more. With a sleek, slim design, it’s the first non-deadbolt option in the Assure Lock series. The Assure Lever comes in two models; a push button keypad (YRL236) and capacitive touchscreen (YRL256). Users can unlock and lock using their entry code on the keypad —the levers are key-free so they are tamper-proof, and there’s no keys to lose. The Assure Levers can be used as standalone keypad locks, or as smart locks that can be fully integrated into a smart home or alarm system with the addition of a Connected by August, Z-Wave Plus or Zigbee Yale Smart Module. The standalone version can be upgraded with any Yale Smart Module at any time. Smart Modules for Control4 and Crestron will be launched in 2019. The Assure Lever will also satisfy smart lock sister company August’s community, which has long requested a non-deadbolt, August-enabled lock. 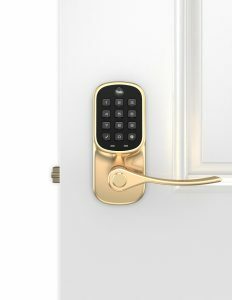 The two Assure Lever models mark the fourth and fifth pieces of Yale hardware to be Connected by August since the partnership rolled out with the Assure Lock SL, Assure Lock Touchscreen and Assure Lock Keypad in September. Through the collaboration, the Assure Lock line has Auto Unlock, remote monitoring, voice assistant integration, security system and hosting platform capabilities. The Assure Lever models come in three different finishes –satin nickel, polished brass, and oil-rubbed bronze —and will be available for purchase at ShopYaleHome.com , August.com, and major retailers f or $149 – $299 MSRP (depending on the model and connectivity) in Spring 2019. For more information, visit YaleHome.com.